This lovely pillow is made of polyester/viscose and 95/5 feather/down. It has a solid reverse and contrast piping. Comes with a hidden zipper closure. 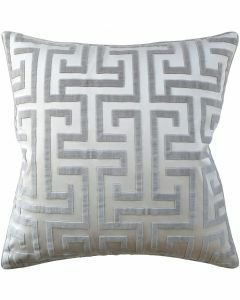 The pillow is available in two sizes: 22” x 22” or 20" x 20" (please note, this option may have a longer production time). Please select size from the drop down menu below. The pillow is handmade in the USA from imported fabrics. Dry clean only. Please note this item is custom made to order and may not be returned. The production time for the pillow is approximately 4-6 weeks. Please note, due to the nature of this print, this fabric is random cut; pattern placement may vary from photo and from pillow to pillow. Click on image for greater detail.